The Updates tab within WordPress is exceptionally useful. This is where you can see if you have the most recent version of WordPress installed, as well as find out if you need to update any of your plugins. From within your Dashboard, you are able to take care of any of the tools that you require to ensure that your site is as optimized as possible. When you are in your dashboard, at the top left of the page, underneath where it says Dashboard, you will see the tab to click on for Updates. The number to the right of the Updates link tells you how many relevant updates there are that could be of use to you, or that are important for your site’s performance. 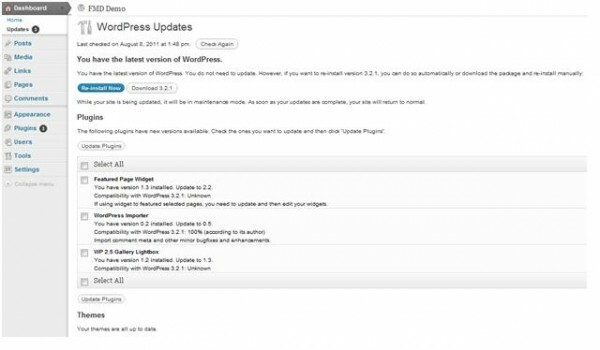 When you click on the Updates tab, a page will open indicating the updates for WordPress itself, and the updates available for any of the plugins you may have installed. Underneath where it says WordPress Updates, it will tell you the current version of WordPress that you are running. It will give you the option of updating if you need to, re-installing if you want to, or doing simply nothing. If you are satisfied with your current version, simply do nothing. Below this area, there is the section called Plugins. You will see all of the plugins that you currently have installed that there may be updates for. Should you wish to update any or all of your plugins, you will click the box next to the plugin or plugins you wish to update. Once you have done so, then you click on the Update Plugins button and it will automatically update those plugins that you have selected. Using WordPress is one of the easiest methods there are of creating your own website. Also, WordPress is one of the best sites as far as search engine rankings go, as well. The algorithms of the various search engines pick up on the user-friendly code of WordPress sites and automatically ranks them higher than most other sites that have had professional SEO work completed.